It's crunch time at work and I'm less than a week away from moving from IL back to GA. Posts will be very slow to come over the next 2-3 weeks. I'm popping on WOW here and there as time allows just to relieve a little stress. But I'm not doing anything post-worthy. My Hunter has a nice bit of rest bonus so I'm just doing a little silent and solo grinding. Keep checking in. Things will be back to normal very soon. Why do game designers equate being lost with adventuring? Having storylines that prompt exploration is a good. However, having the destinations invisible and no map coordinates is not! My idea of fun isn’t running in circles looking for a named location that I can’t see on my map. Sure, there are modifications to will reveal all locations or add coordinates. I’m just wondering what made any designer think that being lost was fun. One of the first things I noticed and loved about EQ2 was the “way points” feature. If you’ve never played, a way point is a glowing light that leads you to quest destinations or NPCs. The actual location is hidden on the map until you’ve been there once, but at least you have a clear indication of where to go. Guild Wars uses a similar feature but the location glows on the map. Again, you can’t see the actual terrain until you’ve traversed it once, but you can just following the green dot on your mini map. Asheron’s Call just gives the exact map coordinate and lets you find your way. WOW doesn’t do any of these things. The location is hidden on the map and there are no actual coordinates given or built into the game. Most players have a map mod that reveals all and/or adds actual coordinates to the game. If you use web sites such as Thottbot to get help on quests and item drops, comments usually include the coordinates. Exploring is fun and encouraging investigation of the unknown useful. But being lost while you’re running on foot isn’t. I try to answer noobs asking for help in locating quests and NPCs. But many of the other players consider their spasm for assistance a nuisance and respond in a less than desirable manner. If the information is available and clearly having it not considered against WOW player conduct, then Blizzard should just add it to the game and stop all this running in circles nonsense. Last night I listened to the first two and only, podcasts available from TTH. The shows were very entertaining. It’s a combination of gaming news, reviews and their personal MMORPG experiences. I like the fact that these are long time gamers. The show is a free form dialogue between 6 personalities – I think, talking about the games they are currently playing or evaluating. Lots of good insight and points of view from different playing styles are presented. They even have an avid solo player a.k.a. grumpy old man, who doesn’t think much of PVP. This is the only podcast I’ve listened to so far that really asks questions about solo content and includes that as part of their evaluation and review criteria. If you haven’t given this show a try yet, you certainly should. The only thing that I still find unusual, although common, is that none of these players have done the end game in WOW. However, they are not alone among podcast producers. And I can understand how playing so many games, would hinder the ability to reach the end game in one. It's crunch time at work and I'm in the process of moving. Hence, I've had no time at all to play any of my favorite MMOs. *Sigh* Life can be a little too real sometimes. Woe is me - I miss my WOW toons the most. For the first time in 3 months I didnt even have time to download any podcasts either. I'm really going through game withdrawl. /e Looks for a local rehab center. Have fun for me and kill a few honor in my name! /e Slaps all Horde nooblets in sight. Err - except the ones who read my blog. I jumped on Guild Wars the other night. I hadn’t been on in a couple of weeks. Short on time, I didn’t get much accomplished. I’m not in a hurry to enter pre-Searing, so I wandered around Lakeside and picked up a couple of simple quests. Observing the countryside I realized that the graphics were growing on me. I liked them better now. I don’t like them as much as EQ2 or even the flat stylistic graphics of WOW, but they’re not so bad. I’d enjoy them even more without the constant halo effect. It’s a bit over-used and often makes me feel like the graphics are out of focus. Granted, the landscapes are intricate. However, they feel so very hollow. Even with the terrific mob A.I. and abundance of NPCs, it still feels pretty lifeless. I attribute this to the fact that GW heavily instanced. This makes the quest areas lonely even with five players in a group. I’m glad the graphics are growing on me. I’m not playing much these days but when I do, imagery is important. The Gallows - not exactly the kind of picture you'd want to post in your diary or send back home about your travels. But such are the sights and sounds of Tanaris. Located in southern Kalimdor, Tanaris is a desert filled the type of creepy crawlies you'd expect. The central outpost in the area is Gadgetzan. You can find supplies, an Inn, bank and auction house inside the adobe encirlced town. 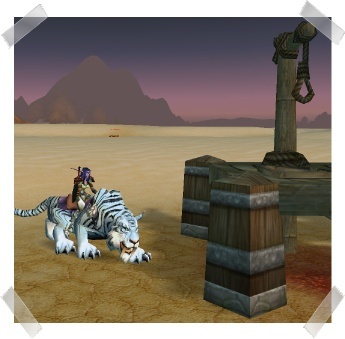 Questing in the area is best suited for levels 40 to 45 for groups, or 45+ if you like to solo. Mobs outside of the nearby Un'Goro Crater drop herbs or you can farm for Firebloom and Purple Lotus on the ground. Miners can find a moderate amount of Mithril, Truesilver and Thorium. Fisherman can fish off of the peer in Steamwheele Port. The quest to obtain your mount speed boost (Carrot stick) can be completed in Zul' Farrak. There are plenty of slay and collection quest starters in Gadget. On PVP servers this is a highly contested region. Expect to be ganked and terrorized. Unless you're a glutten for punishment or level 55+, stay clear of the Crater which is usually being farmed for its elemental fire. My Favorite Grind: Moonshade Ruins, Waterspring Field and East Moon Ruins - where I grind the various enemy humanoids. An emote is a symbol or phrase used to express emotion in text-based communication environments such as, chat, email and now online games. The first time I saw one, I didn't understand what it meant. That was back in my Netscape Navigator days - guess I'm dating myself. Now they are as common as "real" words or punctuation. World of WarCraft is no expection. Emotes are fun. 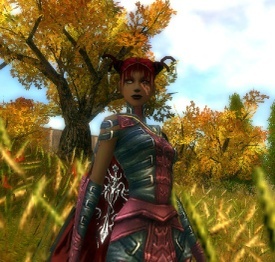 They add personality to chat and an aspect of role-playing to player conversations. Some people just like using them even when they aren't chatting - especially the animated ones. Stand next to the mailbox in Ironforge and you'll see dozens of toons dancing, crying, hugging and kissing passers-by. There are a handful of commonly used emotes such as saying "hello" or "goodbye". You can also just make up a text emote like, "Saylah is sick of the lag on Illidan and taps her foot impatiently." This kind of emote just appears as text in Say chat. All emotes are used by typing the slash command in front of the emote. While reading through a WOW strategy guide, I found a list of animated emotes, many of which were unknown to me. Try them out. Remember to use / in front of the emote, such as /boggle. Next time your standing around doing nothing or waiting for the raid to get going, impress your mates with a lil something different. You'll notice a few changes on the blog over the next few days. It's springtime and I'm a chick - I need a little change to match the season. I'm lightening up the overall look and feel and playing with a couple of fun widgets that you'll find in the margins: Weather Bug and EBay Auction Search. My offical re-design is underway but a little behind. This is just an in-between spruce up. Here are a few things that weren’t so obvious to me during the first few sessions of playing EVE Online. I’m still a total noob so these tips aren’t hidden secrets. Hopefully someone out there will find them useful. I’ll be adding more as I learn more about the game. Skill training is very intricate, often requiring the completion of many other prerequisite skills. I keep up with what I need to do, and the order in which I need to do it, by using the in-game Notepad. I also use the pad to keep track of what I want to buy, how much it costs and what skills will be needed for operation. The Notepad is located on the left-side toolbar. Your Journal contains several tabs of information. One of the tabs lists the Agents and any active missions. You can double-click the mission to quickly view the objectives, current status and requirements. Use the location links in the mission to set your destination points, then set your ship to Auto-Pilot and away you go. Before you can use your ship's weaponry, you must equip each weapon with the appropriate ammunition. From the Ship Fitting window, right-click your weapon and choose Information. The description tab will tell you what kind of ammo is required, which you'll need to buy on the open market. After you've purchased ammo place it into your Cargo Hold. Drag the ammo from your cargo hold to the weapon to fill the cartridge. Make sure to watch how much ammo you have equipped before engaging an enemy. You can load more ammo during flight but there is a short delay. Right-click the weapon and select "load" to add ammo to the cartridge. You can earn good money and NPC reputation by killing "rats" - game controlled bad guys. I like hunting rats as an alternative to completing missions or mining. Trolling the asteroid belts is a good way to find them. While in space, right click and choose Asteroid Belts. You can use this menu to zip back and forth looking for rats, or choose "Add Asteroid Belt to the Overview". I like adding the belt to the overview, and then I can use "Warp to..." and cycle through the areas. Rats will show up as red entities in the Overview. Their names are usually preceded by a faction identifier like Blood, Serpentis, etc. When selected, the Overview pane will show you how much ISK you will be awarded for the kill. If you like hunting alone, you might appreciate a little help. Get yourself a Scout drone for some low-level damage output. You'll need to have a Drone Bay in your ship; check using the ship's Fitting view, and Scout Drone Operation Level 1 skill. Launch your drone a safe distance from your target. Instruct the drone to attack your locked target. While the rat focuses on attacking your drone, you attack the rat, and kill it as quickly as you can. This really needs to be corrected. I’m tired of having to attempt my login a half-dozen times or more, and sit for long periods of time trying to authenticate. This isn’t the quality of service I expect for my monthly payments. The first time this occurred world-wide, we were told that it was an issue with AT&T, the NA WOW internet service provider. However, two weeks later most servers are still experiencing the same problem and fingers are no longer being pointed at the ISP. I guess it’s safe to say that this is a Blizzard issue – a World of Warcraft issue. I get that there are millions of players trying to log into the servers each day. But guess what? That’s not my problem. We weren’t in control, or in this case, not controlling the number of players and toons that were allowed to be created on each realm. I bought WOW to play and I pay the monthly fee to play. I don’t like the long queues but I can get over them. 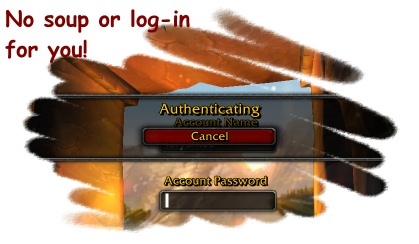 What I don’t like is not being able to log in at all or having trouble authenticating, and then getting dumped into a queue. This authentication problem is unacceptable and needs to be fixed!